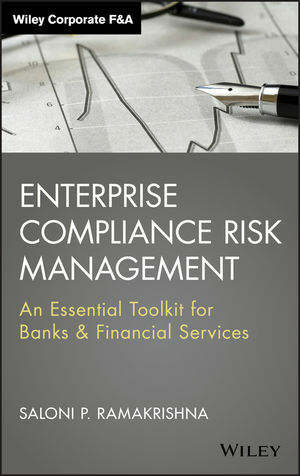 Enterprise Compliance Risk Management: An Essential Toolkit for Banks and Financial Services is a comprehensive narrative on managing compliance and compliance risk that enables value creation for financial services firms. Compliance risk management, a young, evolving yet intricate discipline, is occupying center stage owing to the interplay between the ever increasing complexity of financial services and the environmental effort to rein it in. The book examines the various facets of this layered and nuanced subject. Enterprise Compliance Risk Management elevates the context of compliance from its current reactive stance to how a proactive strategy can create a clear differentiator in a largely undifferentiated market and become a powerful competitive weapon for organizations. It presents a strong case as to why it makes immense business sense to weave active compliance into business model and strategy through an objective view of the cost benefit analysis. Written from a real-world perspective, the book moves the conversation from mere evangelizing to the operationalizing a positive and active compliance management program in financial services. The book is relevant to the different stakeholders of the compliance universe - financial services firms, regulators, industry bodies, consultants, customers and compliance professionals owing to its coverage of the varied aspects of compliance. Enterprise Compliance Risk Management includes a direct examination of compliance risk, including identification, measurement, mitigation, monitoring, remediation, and regulatory dialogue. With unique hands-on tools including processes, templates, checklists, models, formats and scorecards, the book provides the essential toolkit required by the practitioners to jumpstart their compliance initiatives. Financial services professionals seeking a handle on this vital and growing discipline can find the information they need in Enterprise Compliance Risk Management. SALONI P. RAMAKRISHNA has nearly three decades of experience in financial services, both as hands-on professional as well as a solutions architect and contributor to the industry dialogue. She has been invited to share her thoughts and views on industry trends surrounding compliance, risk, customer centricity, performance, and data management in the analytics space by national and international banking and finance forums. Saloni's ideas have appeared as articles and quotes in newspapers, journals, magazines, and television interviews. She has presented papers at national and international seminars and conferences. Since 2012, she has been a columnist for one of India's leading monthly magazines. She is currently a Senior Director with Oracle. In her role she frequently interacts with top managers of banks, consulting professionals, financial services bodies, and senior regulators across multiple countries.